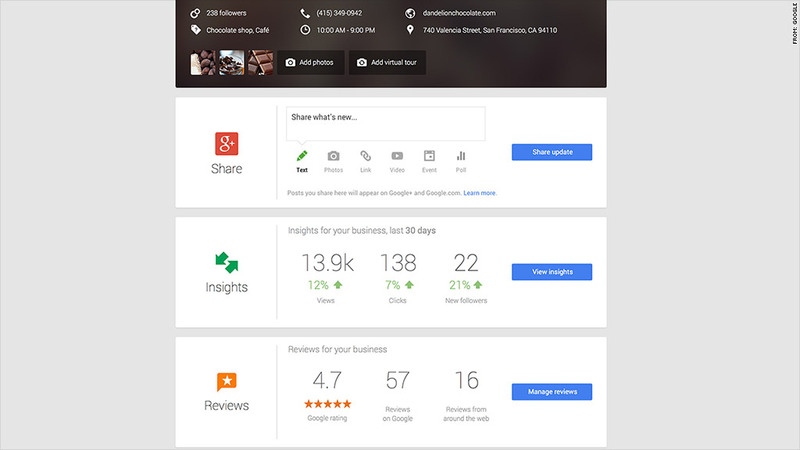 Google unveiled it's new "Google My Business" platform for small businesses on Wednesday. Google unveiled a new marketing tool to help small businesses better connect with their customers. The "Google My Business" service launched Wednesday and offers Google (GOOG)'s various tools -- Search, Maps, Google +, Insights, Hangouts -- in one platform. "We've never pulled together all of these features into a single hub that's easy to use," said Jen Fitzpatrick, Google's vice president of engineering and product management. "The idea is to let small businesses manage their online presence in a single, consolidated way." Firms can customize their own dashboards with photos and videos about their businesses. They can also communicate with their customers in a more targeted way by responding to reviews and connecting through Google Hangouts and Google+. "Business owners are busy and many have said they're overwhelmed by the technology out there," she said. "We spent time thinking about how to make things simpler to empower businesses to become successful online." The service is free and rolls out to Google's 2.2 million advertisers, the majority of whom are small businesses. Google will also soon launch a My Business app for Android and IOS devices, said James Croom, marketing manager with Google's small business team. Croom said research showed just over half of U.S. small businesses with less than 200 employees have a website. So Google used this insight and feedback from its small business users to develop My Business. However, there is one thing that the dashboard won't do. Using the service doesn't mean that a business might also get a coveted higher placement in Google's search results. "This isn't meant to change or influence our search rankings in any way," said Fitzpatrick.